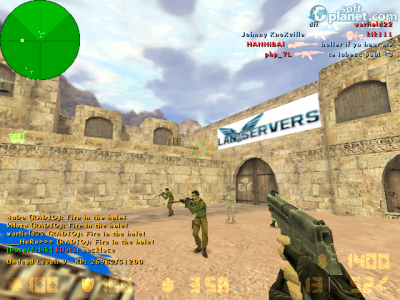 SoftPlanet makes it possible for everyone to get free Counter Strike download directly from our servers. There is no registration needed for downloading. Today there are a lot of shooters that count on multiplayer, but none of them is as popular as Counter Strike. Yes – now there are better products that offer awesome experience, like Battlefield 4, but their concepts derive from the classic game released in the distant 1999 year. That's why we give you Counter Strike 1.6.0 for download, which is probably the last version of this game. This edition is free and portable so you can easily set it up on your PC and you can start connecting to different servers where you can choose your team and weapons. Probably there is no reason to describe how to play this game and what its functions are, but if there are still people that haven't played this game they will need this description. The main feature that differentiates Counter Strike is that the game divides the players into two team – counter-terrorists and terrorists. Once you select to Find Servers the game will open for you a very long list of Servers that can be used. While we tested the game the available servers were 148. All of them are made on different maps, but if you want to try some other map from the large list of available ones you can create your own server and then you can wait for other players to join your game. If you want to try maps on your own you can add Bots which are terrorists or counter-terrorists played by the computer. 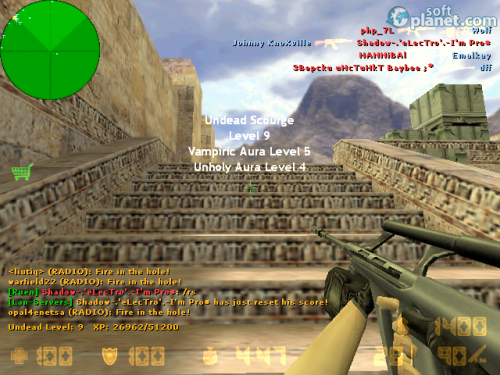 The thing for which Counter Strike is most famous is the multiplayer, so usually most of the players just join a game and enjoy the fierce battles that usually occur. The only problem that we can mention for Counter Strike is that its graphics are a bit outdated. This is not something that should surprise you, because, as we explained, the game was released in 1999 year. When it came out, its graphics were at the top of first person shooters, but it is only natural that the games developed with time. Still, the way in which the game looks is very well know to all the gamers around the world and it gives a nice impression to everyone that start playing. The two teams are nicely portrayed and you can choose from Arctic Avengers, Elite Crew, Guerillas Warfare and Phoenix Connection for the terrorist team. The counter-terrorist team includes GIGN, GSG-9, SAS and Seal Team. All of them are nicely displayed and they give you a sense of involvement with any of the teams. Of course, the sense is not like in the modern game, but for such an old game it is still awesome. There are a lot of ways in which you can adjust Counter Strike. If you want access the main options you have to select the appropriate menu from the main screen of the game. 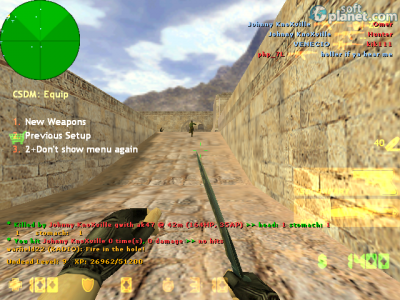 From there you can change your player name, you can add your Spraypaint image or you can change the way in which the crosshair appears. Besides that you can change all the assigned keys on the keyboard or you can set the mouse. There are also adjustment options that let you change the audio and video settings. If you want, you can change the Voice and its volume or you can lock the inappropriate images for younger players. If you want to adjust the server and multiplayer settings you can do it from the in-game settings. The sound of Counter Strike doesn't include music which was always disappointing, but in this way you can focus on killing your enemies. At the same time the sounds of your weapons and the communication with your team are great. You will feel like in a real battlefield, where there is shooting from every place, explosions and shouting. There is a good reason why Counter Strike is still played by a lot of gamers and why it was played by them for more than 14 years. The game features fun battles that will give you the sense of a real time battle, even though the graphics are old. It offers a nice selection of weapons that feel like real ones, and we are sure that everyone will get hooked up to the game pretty quickly. The game is also quite customizable and offers a nice selection of maps and servers. And on top of it the game is free. Our security scan shows that Counter Strike is clean from viruses. The current version of Counter Strike has been scanned by our system, which contains 46 different anti-virus algorithms. That ensures that Counter Strike 1.6.0 is 100% safe for your computer.